Trailers are fantastic labor-saving devices. Not only do they allow you to transport everything from ATV’s to furniture with ease, but most modern trailers come with tailgates that double as ramps, so you can drive or roll your payload right up into the bed of the trailer. 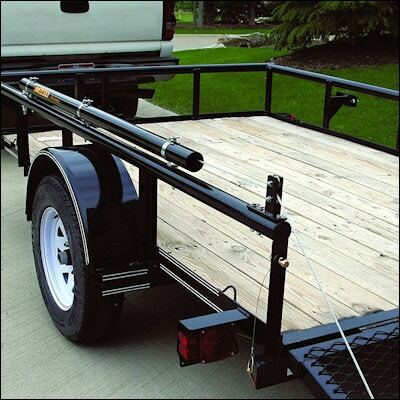 As a site that is centered on the use of tools for lifting stuff (like car lifts, boat anchors, and even people via electric lift chairs) we definitely approve of trailers that utilize the inclined plane to make work easier. But the down side of having a trailer tailgate that doubles as a ramp is that you need to manually lift it more than 90 degrees to close the gate. A 4-6 foot metal tailgate can be heavy, especially if you have to open and close it multiple times. If only there was another lifting tool to help with the job. Thankfully there is – the Tailgate Lift Assist. These little wonders mount to the side (or sides) of your trailer, and then use a cable or chain to do most of the work of raising and lowering your tailgate. They are so helpful that they should be standard equipment on any new trailer you buy. But since they aren’t, we reviewed the best tailgate lift assists on the market, to help you find the right one to save your back. Click the buttons above for detailed information about each unit, or keep reading for our review of each of the top 3 tailgate lift assists. Our top choice for the best product in this review is the Gorilla-Lift 2-Sided Tailgate Lift Assist Model 40101042GS . As the name indicates, the Gorilla 40101042GS is a dual-sided lift, meaning that it attaches to both sides of your trailer and tailgate. The other units in our roundup only hook to one side of the tailgate. That is undoubtedly the reason the Gorilla Lift can handle heavier tailgates than the other units. 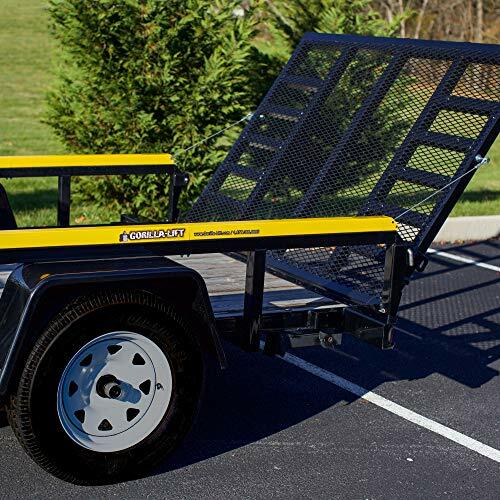 The Gorilla Lift allows you to both raise and lower your trailer tailgate with very little effort. And one of the nice features of this unit is that it can be adjusted to handle lighter or heavier gates. 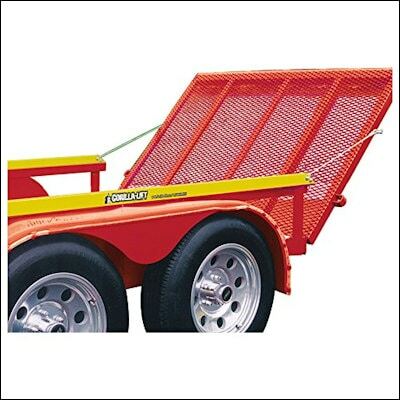 This gives you maximum flexibility with the type of trailer you use with the Gorilla Lift. Other lift units have difficulty with lighter tailgates, and some users even complained that they had to add extra weight to their tailgate to make the lift function properly. The Gorilla-Lift 40101042GS attaches easily and securely to square tube, round tube, and angle iron trailer sides, making it ideal for a variety of configurations. The lifting mechanism is completely enclosed for both protection and user safety, and the housing has been powder coated for durability. Everything about the Gorilla-Lift gives the impression of quality, and that sentiment is largely echoed in the owner reviews. The 40101042GS has been reviewed over 350 times, with 88% of them 5-star reviews, and an overall rating of 4.8 stars. That is an impressive tally, with many reviewers lauding the Gorilla Lift for saving their back. Given the quality, flexibility, and excellent reviews of the Gorilla-Lift Tailgate Assist Lift we’ve awarded it our top choice. And since it can be purchased at a great price, it seems an excellent choice for anyone looking for a trailer tailgate lift assist. Our second choice in our review of the best trailer tailgate lift assists is the Double-Barrell Chain Driven Trailer Gate Lift Assist from RACK’EM. This single-side lift assist is the only chain driven unit in our review, and its over-under double barrell design gives is power enough to make a 200-pound tailgate lift with only 5 pounds of force. It’s like having a power lifter standing behind you helping you raise and lower your tailgate. 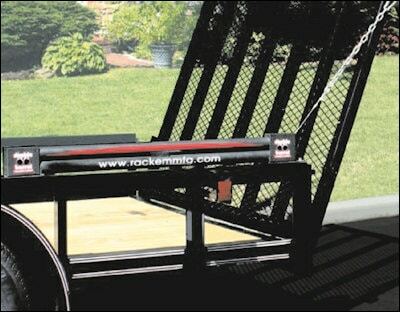 The double-barrel design also minimizes the RACK’EM lift’s footprint, meaning that it only requires 54″ of side length to install. That is the smallest footprint of any of the lifts in our roundup, and will be particularly attractive to shoppers looking for an assist lift for a shorter trailer. 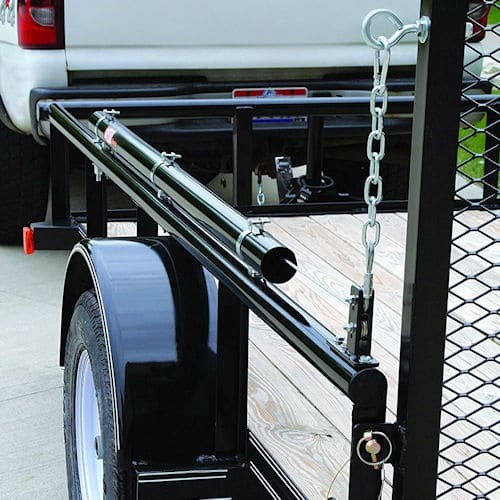 While the RACK’EM lift does work on a variety of sizes, it may require some additional clamps to properly mount on a trailer with tubular sides. And very light tailgates may not be heavy enough to properly utilize the RACK’EM lift. But despite those caveats, the RACK’EM double barrel has a number of very good reviews from owners, with over 85% of them giving it 4 or 5 stars. That praise, along with http://a very competitive price, landed the RACK’EM Double Barrel Chain Driven Trailer Gate Lift Assist in our #2 spot in this review. Least amount of rail space needed - just 54"
Rounding out our collection of trailer tailgate lift assists is the Buyers Products 5201000. Like the RACK’EM unit the 5201000 is a single-sided lift, meaning it attaches to just one side of your trailer. 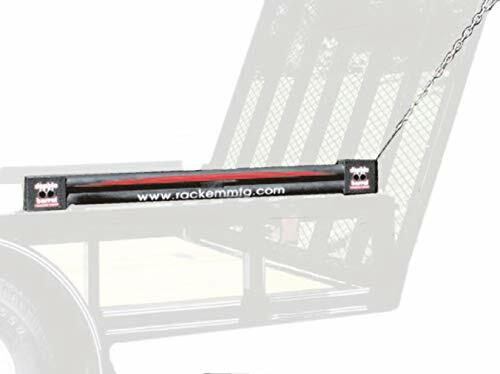 But unlike the chain used by the RACK’EM, this lift uses a steel cable to help lift gates that weigh up to 180 pounds. That is the lowest max strength in our roundup, but more than sufficient for most consumer trailers. The 5201000 attaches best to a flat surface, and posed some difficulties for other configurations. Non-standard attachments could require some drilling to properly secure the lift. But it will work with a variety of trailer side heights – anything from 10″ to 24″ should work fine. The reviews of the 5201000 are overwhelmingly positive, with 80% of owners on Amazon giving it 4 or 5 stars. But there were a few complaints of poor packaging and items missing at installation, so a run to the local hardware store might be necessary in some cases. Overall the Buyers Products 5201000 seems like a decent unit, and many reviewers were happy with how it performed once installed. And while it falls short in our opinion of the top unit in our roundup, it is the lowest price trailer tailgate assist lift of the bunch, so if you are pinching pennies it may be your best option.